Poetess and translator Barbara Korun was born in 1963 in Ljubljana, where she graduated in Slovene Language and Comparative Literature at the Faculty of Arts, going on to teach literature in secondary education. She also worked at the Slovene National Theatre in Ljubljana as a language advisor. Currently, she lives as a freelance author. Her first poetry book Ostrina miline (The Sharpness of Grace, 1999) received the Slovene Book Fair Award for best debut collection. For her fourth book Pridem takoj (I’ll Be Right Back, 2011) she received the Veronika Prize for Poetry (best poetry collection of the year) and the Golden Bird (for outstanding achievements in literature). Alongside jazz composer and percussionist Zlatko Kaučič, she recorded the album Vibrato tišine (Vibrato of Silence, 2006) featuring the poetry of Srečko Kosovel, a great of Slovene poetry. Barbara Korun organizes regular monthly readings of Slovene female poets and is a volunteer for the capital’s asylum home. Her work has been translated and published in twelve monographs and many anthologies in over twenty languages. 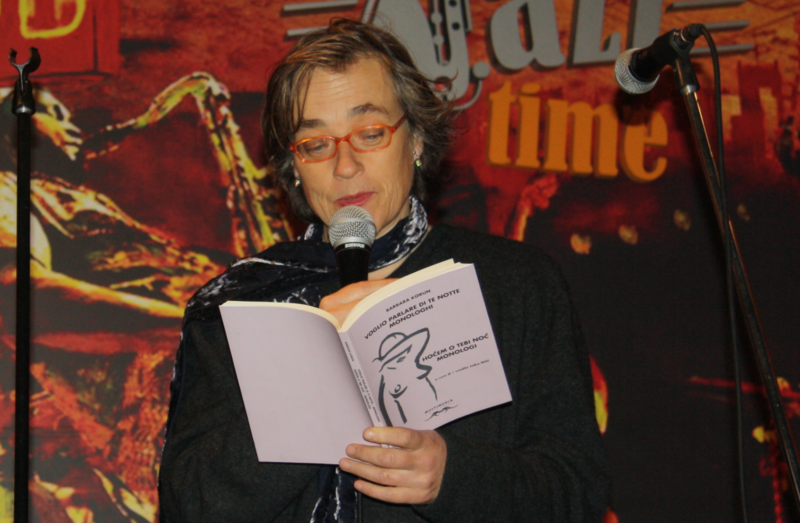 She received two international awards for poetry in Italy. Her last (sixth) collection Vmes (In Between, 2016), was published recently.